Well, it seems like not every member of Norman Osborn’s Dark Avengers is completely on board with the maniac’s plans to oust Marvel’s most popular superteams from power. Not directly, anyway. 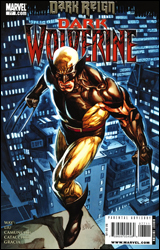 Osborn’s “Dark Wolverine,” Logan’s son Daken, has stepped out on his own, forming a complicated series of alliances with several of the former Green Goblin’s most visible targets, particularly Reed Richards and the Fantastic Four. Just how honest Daken is acting in these negotiations is, naturally, up for debate – it seems his only true allegiance is to himself – but he’s valuable enough of a wild card that members of both sides seem willing to deal with the consequences for a chance to get him on their side. The story this month, provided by Daniel Way & Marjorie Liu, features more of the team than the last two issues of Dark Avengers combined. If you’ve ever needed a bit more proof of why the concept of a squad comprised of loners can never work, look no further. Osborn’s Avengers are going in thirty different directions at the same time, and they’re not only on different pages, they’re often doing everything in their power to thwart the goals of their teammates. More so than even the group’s brave leader, Daken plays the role of the instigator, constantly doing everything in his power to turn and rankle his fellow Avengers in a way that’s sure to lead to fireworks. That’s a welcome change from the character’s usual role as the silent guy in the corner with a pair of claws popping out of his hands, and it fits him well. On the large scale, Way and Liu don’t quite have the knack for each character’s personality that Brian Michael Bendis does, but they’re close, and their actions here will likely have big ramifications on the main series once it returns from a crossover-induced hiatus. Daken’s snide, self-serving taunts of Ares (coupled with the hot-headed god of war’s natural reaction) in this issue’s opening moments give artist Giuseppe Camuncoli a great opportunity to get his foot in the door with a few intense visuals, and he takes it in stride without so much as a glance over his shoulder. By going out of his way to highlight the gigantic size differential between the two, Giuseppe casually shifts what would’ve been a rather ho-hum scene into something else. He keeps the action moving like a good martial arts movie, with a sense of selective slow motion thrown in to highlight the fight’s most explosive moments. Even during the seconds of fleeting pause in between thrown punches, there’s always something moving: an airborne set of dumbbells here, a collapsing door frame there. The dude knows how to put together an exciting fight scene. Giuseppe performs just as well away from the action, although he isn’t quite as comfortable with the Fantastic Four as he is with Daken and the Avengers. Dark Wolverine’s uncomfortable little chat with Venom provides a great display of how restrained body language can often tell more story than a glob of extraneous dialog, but the artist’s renditions of Reed and Sue are shaky, over-muscled and unfamiliar. I guess not every swing can be a home run. If you’re as infuriated with the lack of forward progress offered by Dark Avengers since it was lumped in with the Utopia crossover last month, you might want to give Dark Wolverine a chance to play pacifier. It’s not on the same level as what Bendis was offering, but it’s close enough to make for a decent surrogate until he’s back in the commander’s chair. Borrow it and re-evaluate when things return to the status quo. wow. well, i've been reading comments about the past six issues of (Dark) Wolverine and they crack me up almost as much as the book does. issue #77 was the only issue that sold off the rack at the store i work at, and it's the one i missed. having seen a preview of the first ten pages (along with some cool variant covers) i have to say this run is the best treatment of the character so far. anyway, this title and Thor are the only two titles i have looked forward to collecting every month over the past twelve months, everything else i like has been hit-and-miss for me (we'll see about Siege over the next few months and i'd collect Iron Man on a regular basis, except that sells out quickly, too), pretty much for the same reasons. stretching out character and plot development month-to-month while still delivering the usual goods every issue is a big win, more than i can say about the Avengers titles right now. Daken keeping everybody guessing while doing both heroic and villain stuff is, umm, well, very interesting, and this would get a little boring if not for the cool plot twists. i agree with one reviewer who said that the current Wolverine storyline offers a lot more satisfaction than the Dark Reign Fantastic Four series did with its similar themes. i can't really talk about this issue (#77), but the rest of the run is gold. there is still a lot we don't know about the character, but this run proves he can successfully carry his own title until lesser writers drive him into the ground. the run has a few laughs thrown in with the slicing, bleeding and dying, and a few choice scenes where Daken is "on the ropes" because of unwieldy circumstances. i found the cover of issue 80 to be, umm, well, plotz-worthy and a little hair-raising; we don't see stuff like this too often and it's good to see that the current writers have added wit and sophistication to a consistently violent Marvel title that has grown a little tired, needlessly convoluted and less entertaining over the past few years. oh, and while we're at it, the Dark Wolverine run has been... intriguing; not heavy-hitting like "Dark Knight Returns", but almost as engaging.